Welcome to the birth of the Living Room Amp, which is a novel concept - designing an amp for the living room. The challenge is to make it acceptable to those with taste (i.e. wives). In general, electronics are not acceptable in the living room. The Living Room Amp has the controls in the rear. 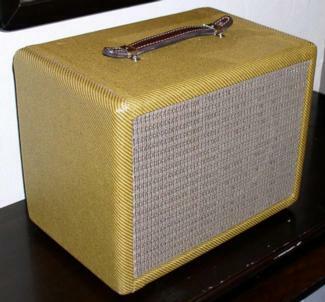 The plan is to make a tweed amp with speaker cloth in the front - a simple, clean look. 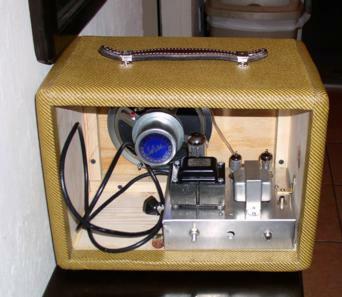 A low-power amp is a must for the living room, and this one has a 1-watt single-ended 6AK6 amp. The speaker is a Weber Signature 6" alnico that sounds fantastic. Here are some sound files with the amp on 10. I used a Fender Strat. You can hear me switch from the neck to the bridge pickup, and then from single-coil to humbuckers. The idea was to show how you can get different sounds by switching pickups and varying your playing. The cabinet is soft pine with 1/4" finger joints. These photos were taken before using wood filler on the joints. Here's the cabinet after rounding the edges. The amp will be mounted vertically on right side, although there might be room to put it on the bottom. 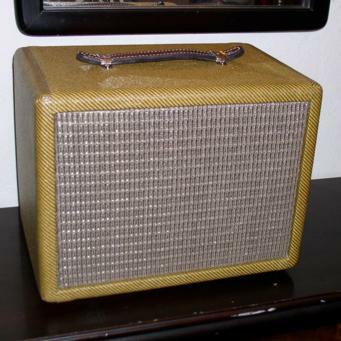 The speaker is a Weber Signature 6" Alnico.